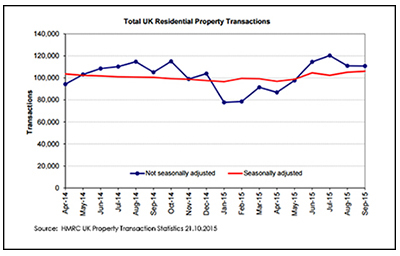 HM Revenue & Customs' latest UK property statistics show a 5% rise in property transactions with 110,840 completed sales in September 2015 compared to 105,170 in September 2014. These non-seasonally adjusted figures show a fall in sales over the summer from a 2015 high of 120,300 transactions in July 2015, to 110,980 completed transactions in August 2015. On the other hand, the seasonally adjusted figures show a slight uptick from July to September.